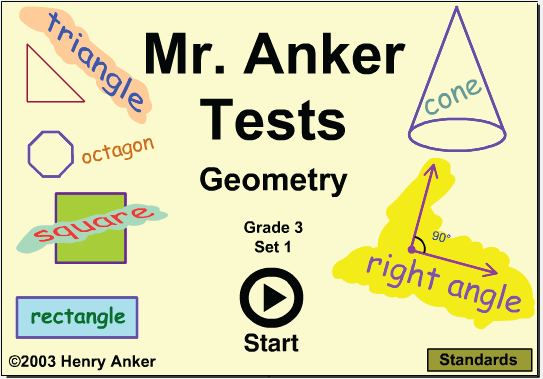 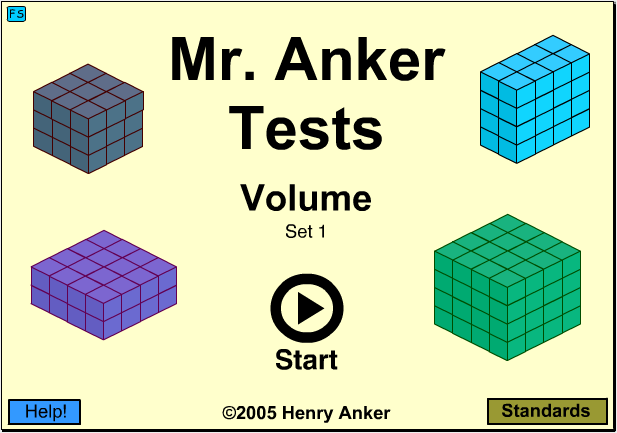 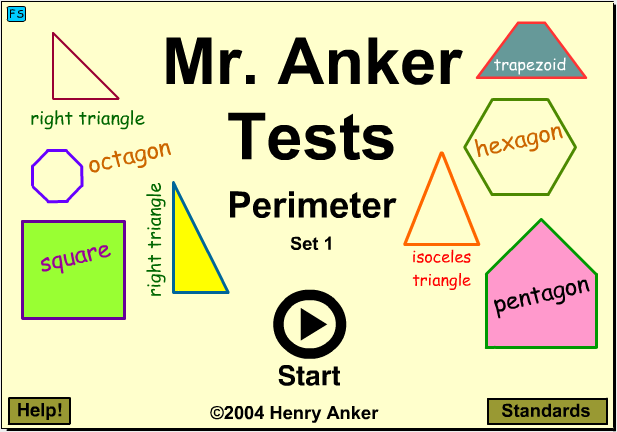 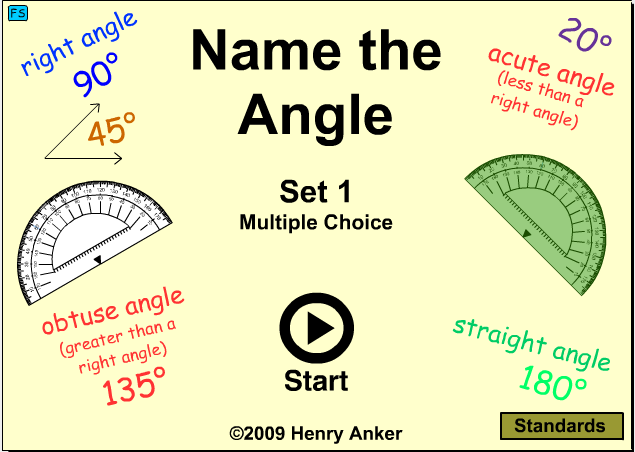 Use these practice activities to help you master your Geometry Skills!! 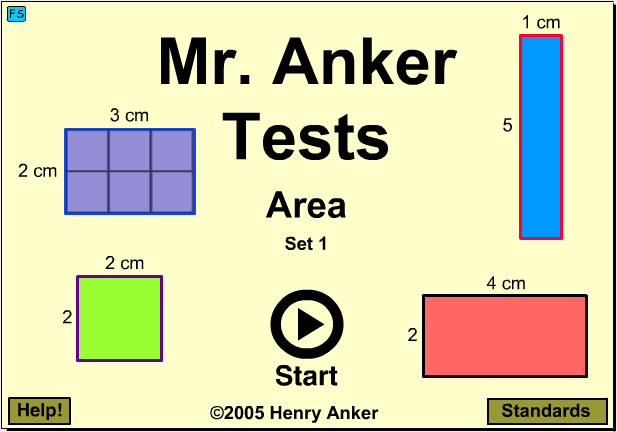 Remember, a square is a kind of rectangle. 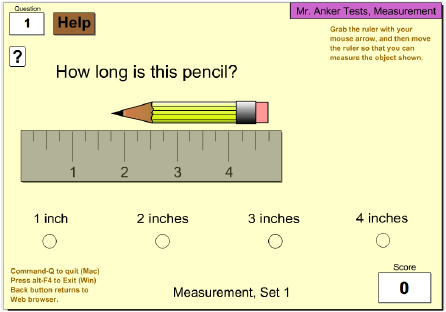 Measure objects to the inch and half inch by moving the ruler. 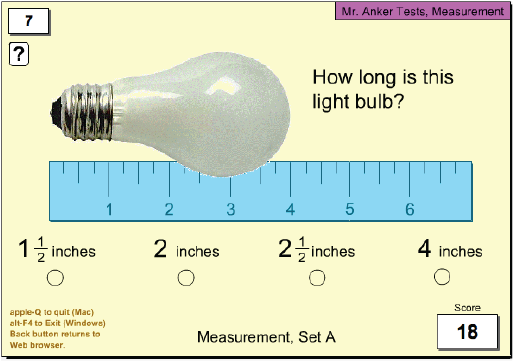 Measure item to the quarter of an inch. 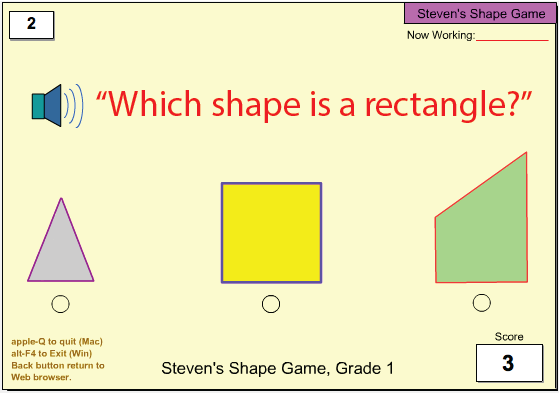 Basic two dimensional shapes and properties. 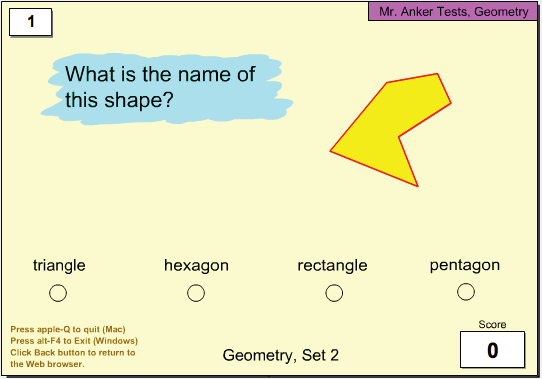 Work with terms like hexagon, square pyramid, rectangular prism. 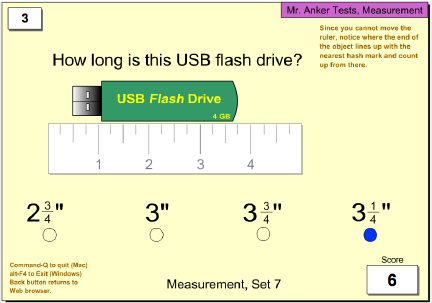 Measure item to the eighth of an inch. 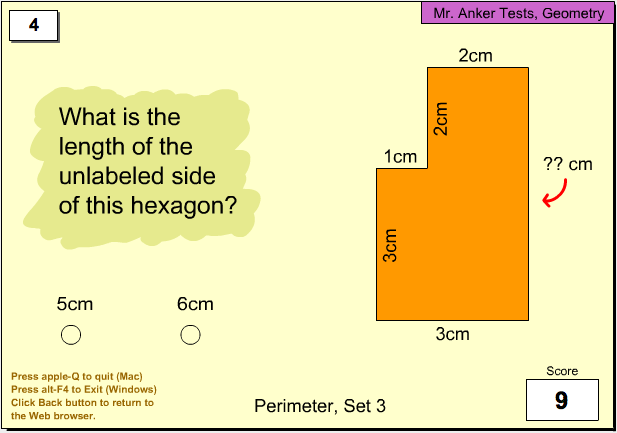 Calculate area of figures with integer sides. 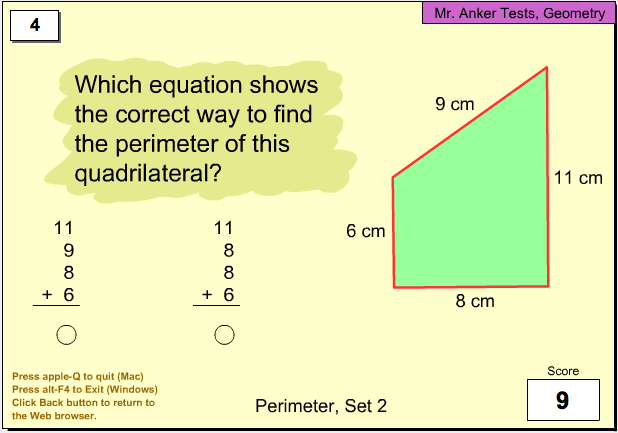 Calculate area, with emphasis on process and thinking algebraically. 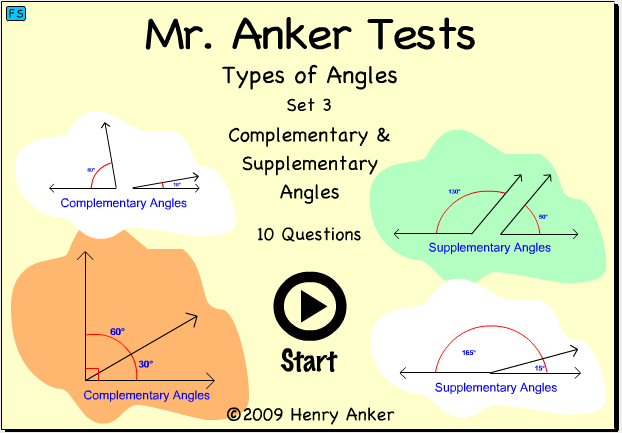 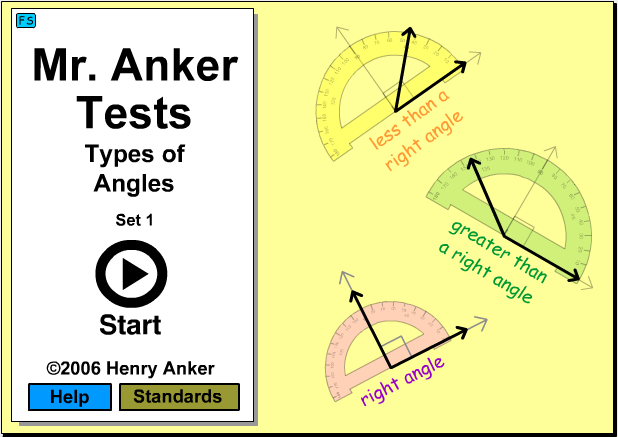 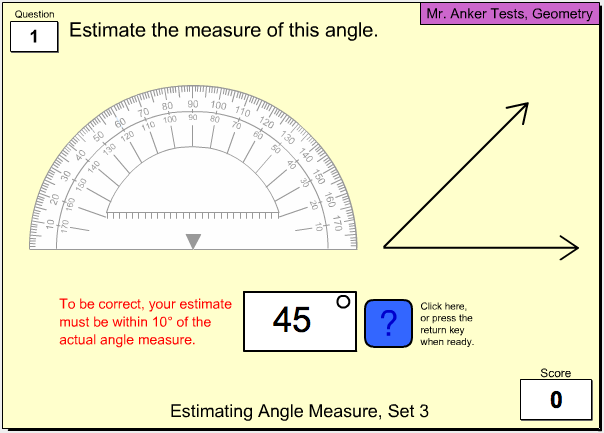 Tell if an angle's measure is less than or greater than a right angle. 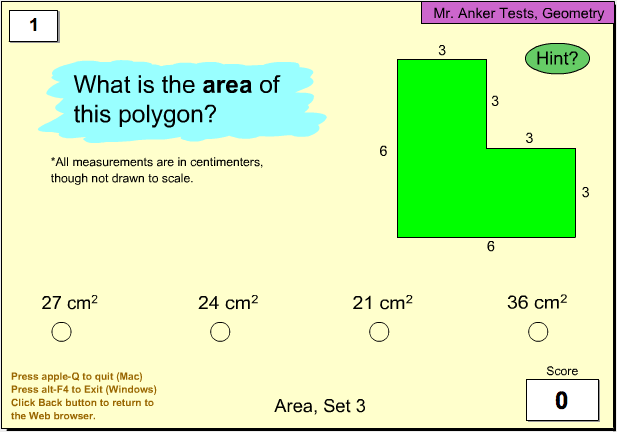 Calculate area of rectangles using the length x width model. 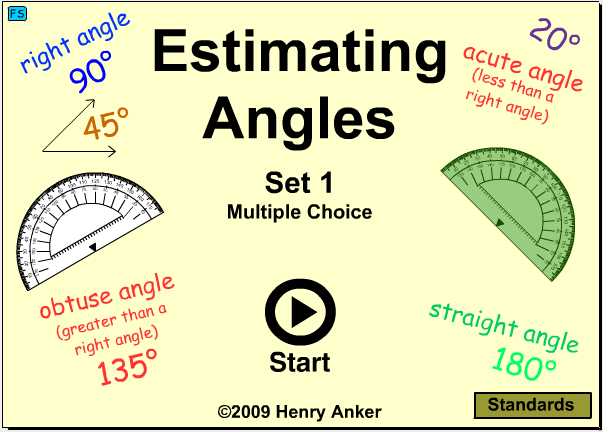 Calculate the area of a figure by counting whole & half units. 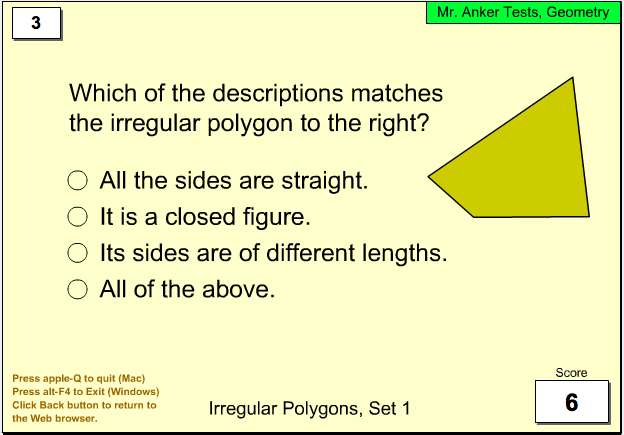 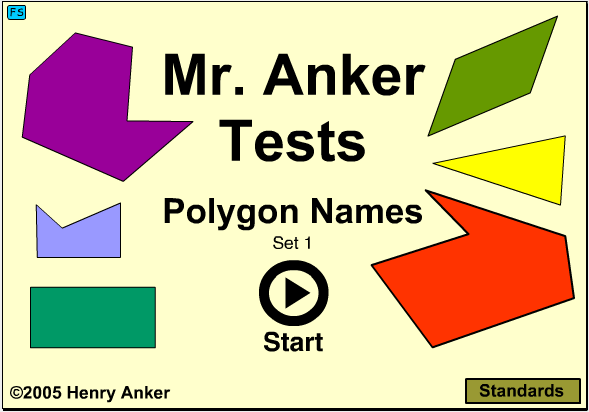 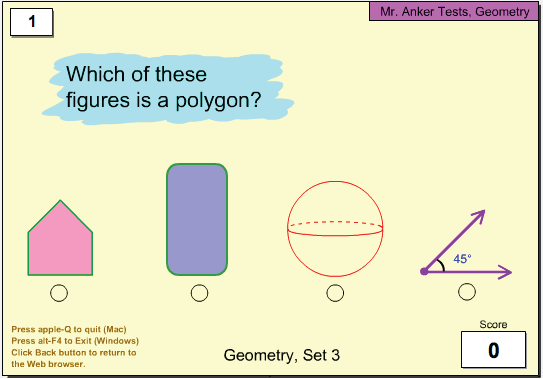 Identify irregular polygons by various attributes. 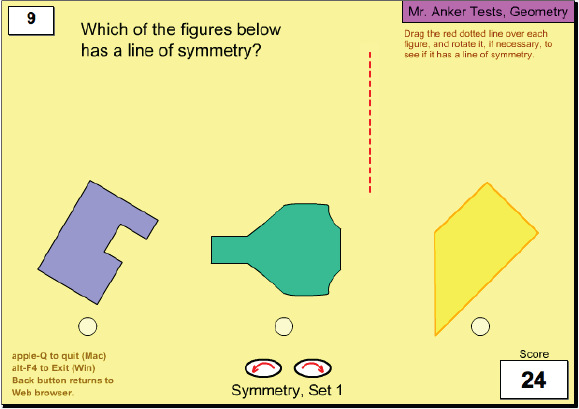 Identify figures with a line of symmetry. 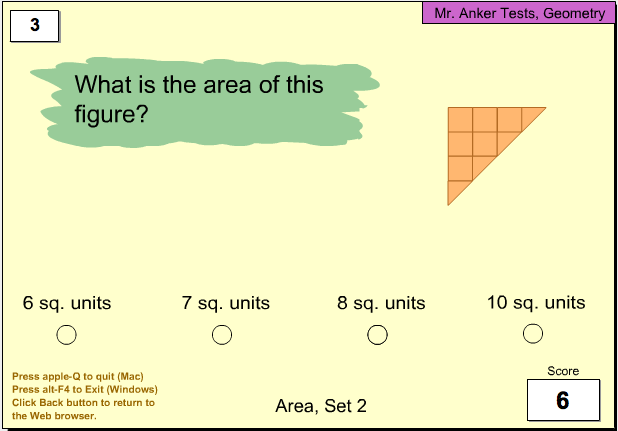 Determine the area of figures that can be divided into easy to calculate parts. 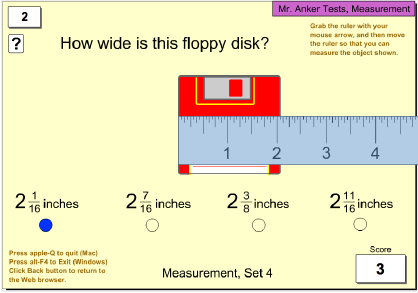 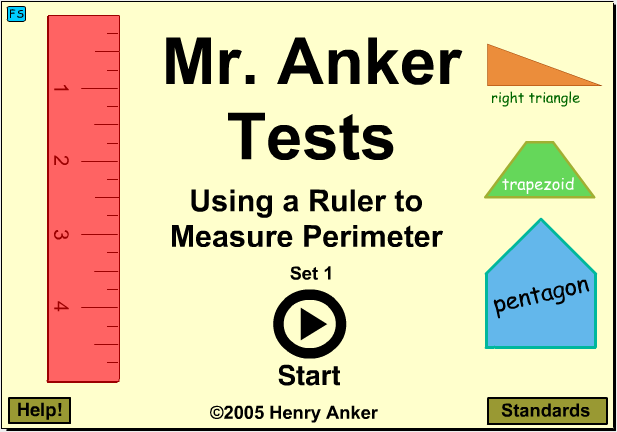 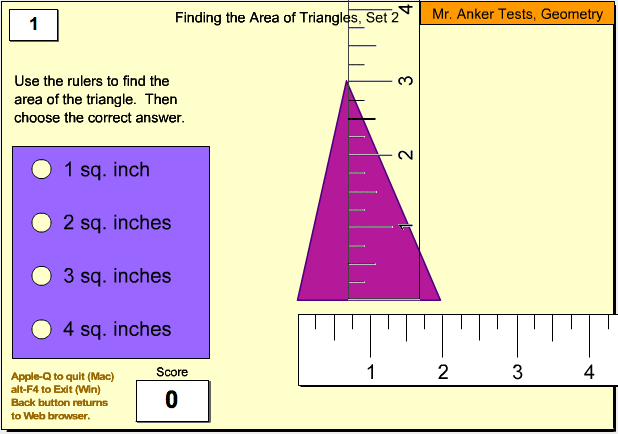 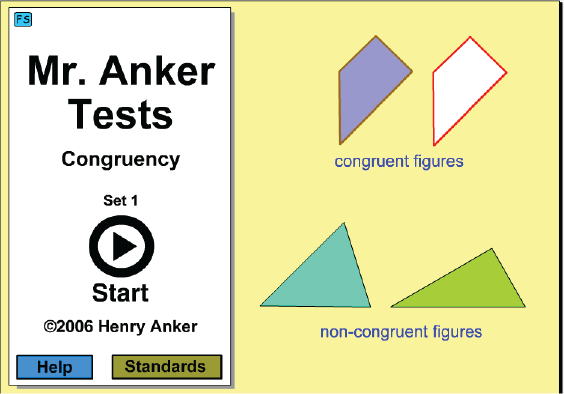 Determine the area of figures using a ruler on the screen. 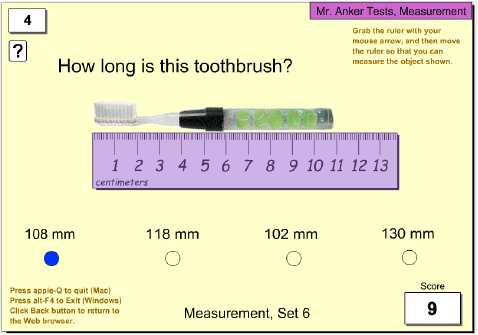 Measure to the nearest sixteenth of an inch. 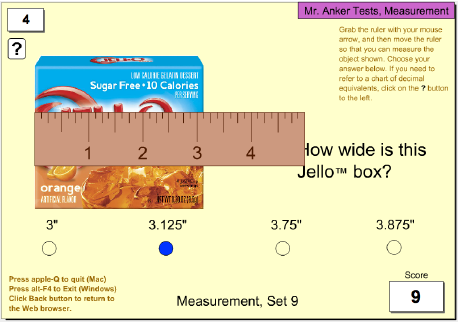 Measure to the nearest centimeter. 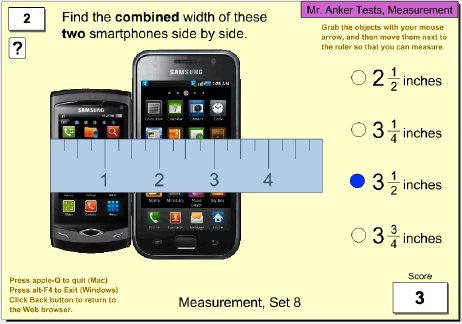 Measure to the nearest millimeter. 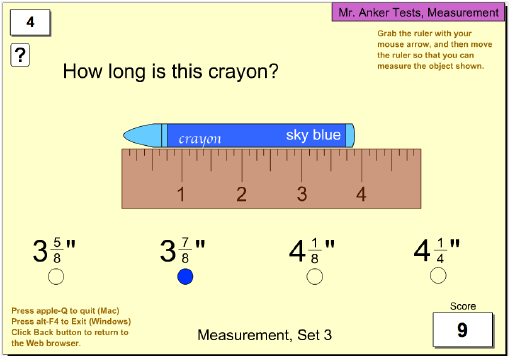 Measure without the ability to move the ruler. 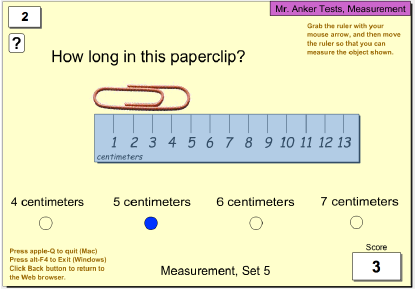 Items originate ate random points. 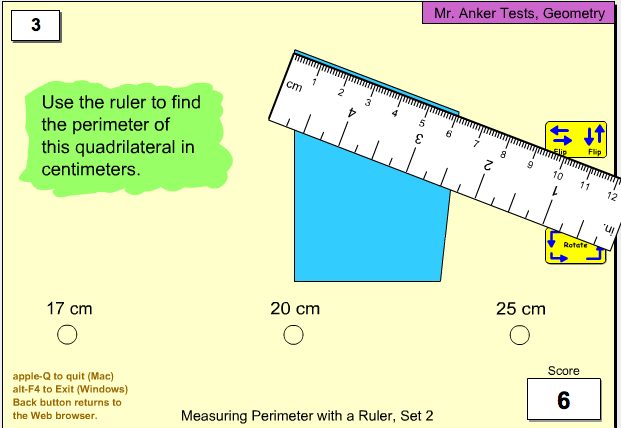 Use a ruler to find side lengths & add them. 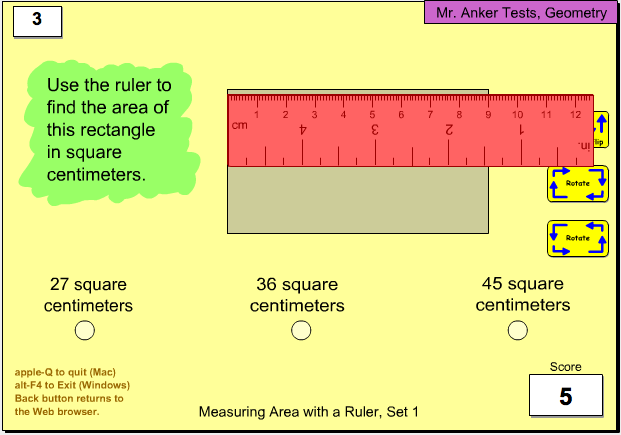 Use a ruler to find the length & height and then apply the formula 1/2b x h = Area(sq). 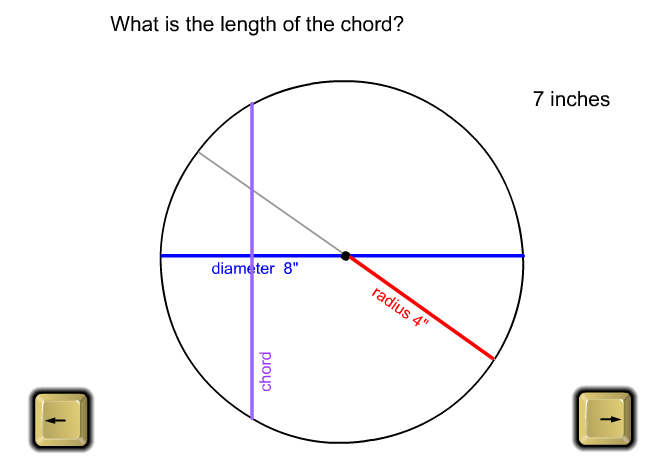 quarter, eighth, and sixteenth inch. 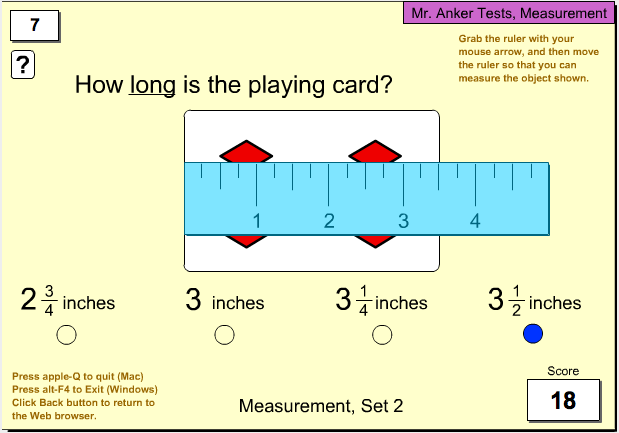 Convert the standard measure to decimals, using a conversion chart. 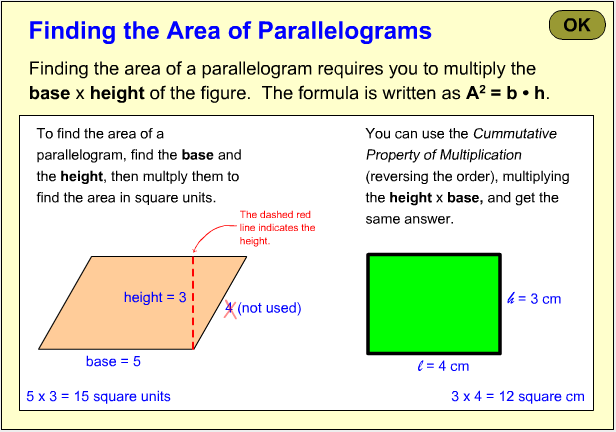 Use the proper formula to calculate the area of parallelograms. 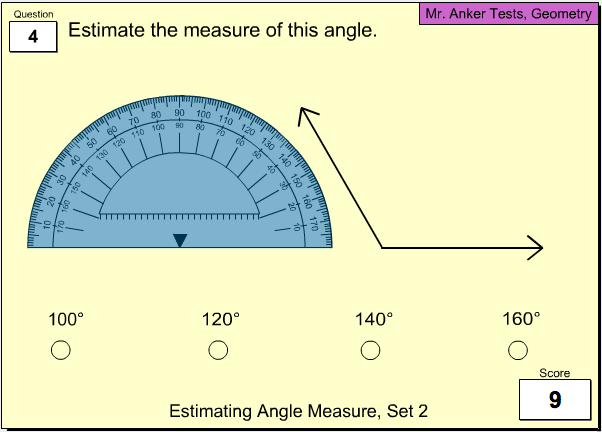 Find the degree measure of an angle. 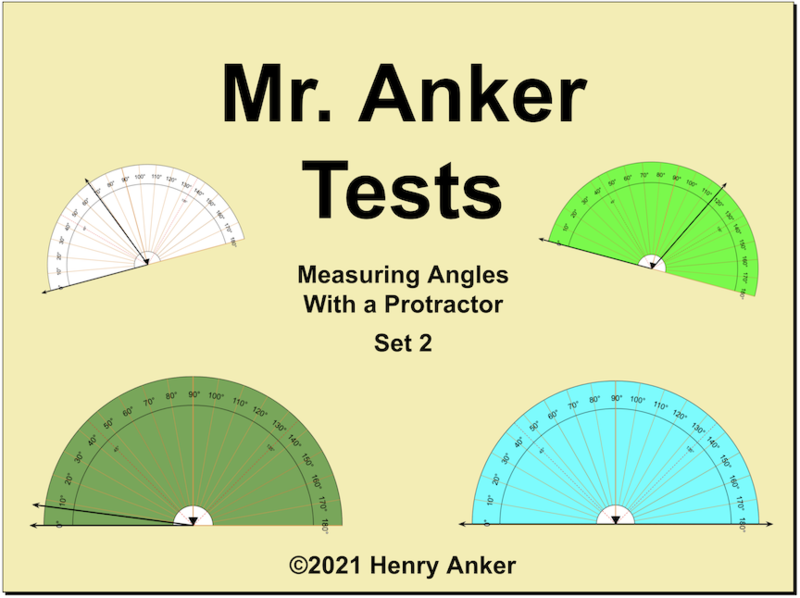 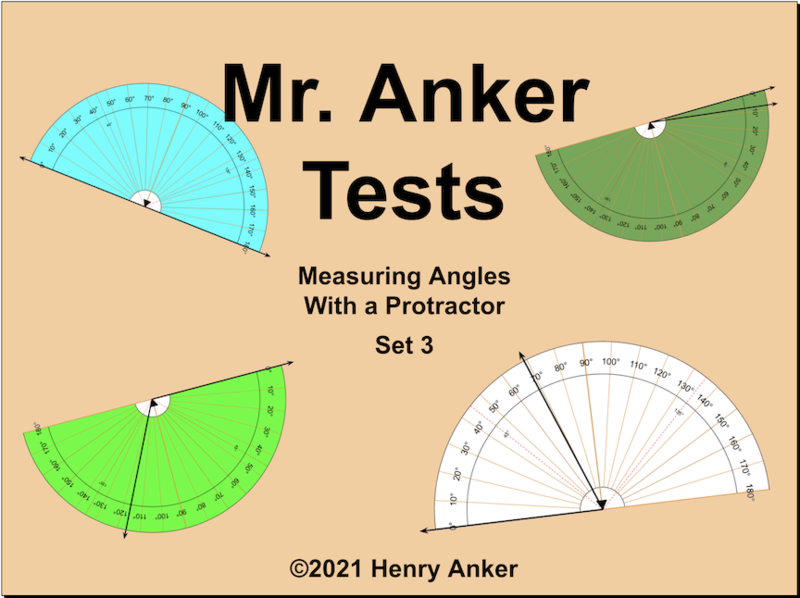 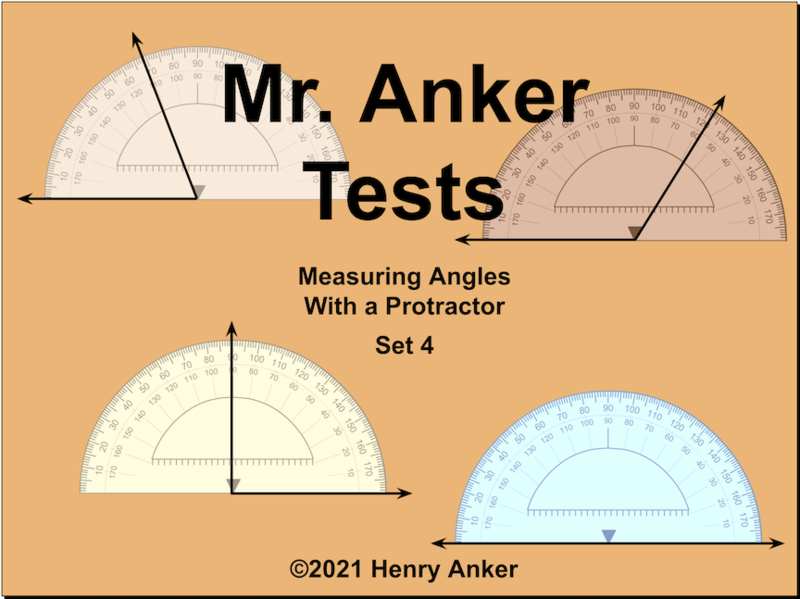 Estimate the degree measure of an angle using a neighboring protractor as a reference. 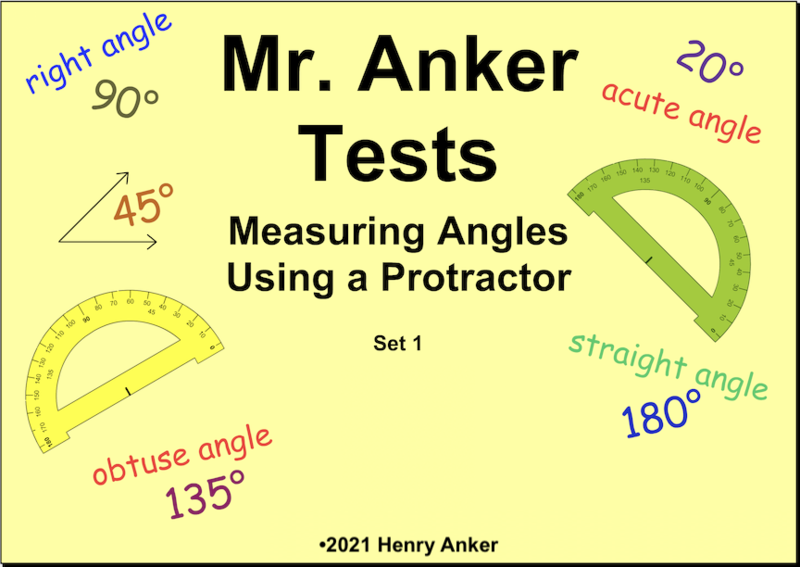 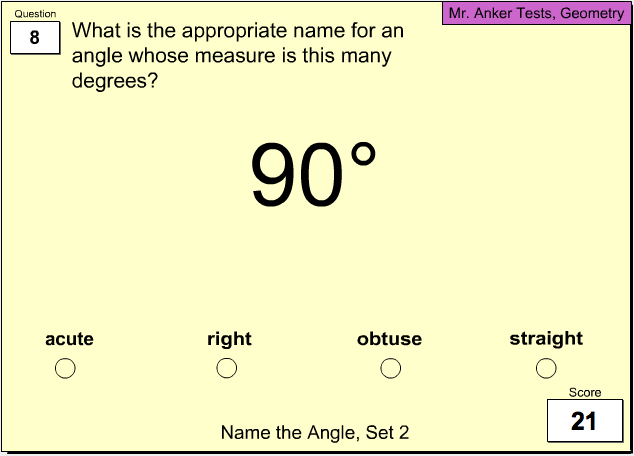 Estimate, by entering a value, the degree measure of an angle, within 10 degrees, using a neighboring protractor as a reference. 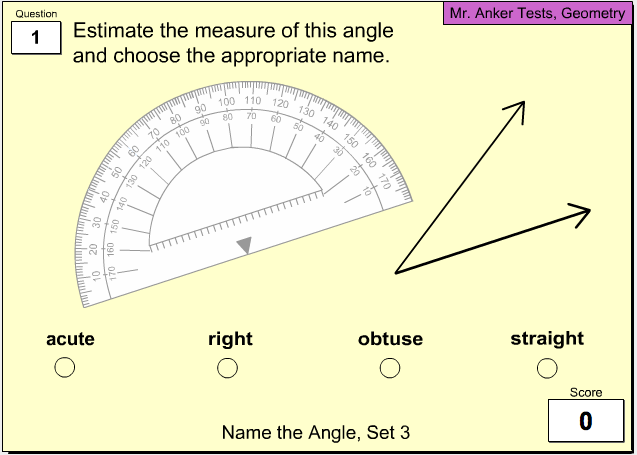 Identify angles as acute, obtuse, right, straight using a protractor as reference. 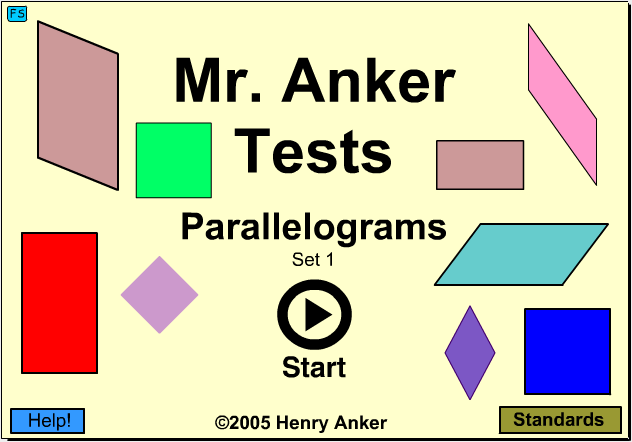 Identify the attributes of parallelgrams. 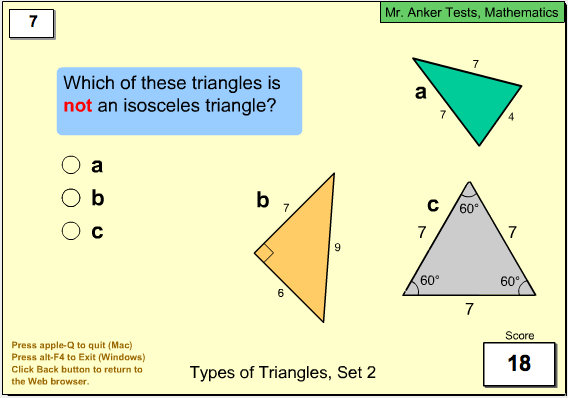 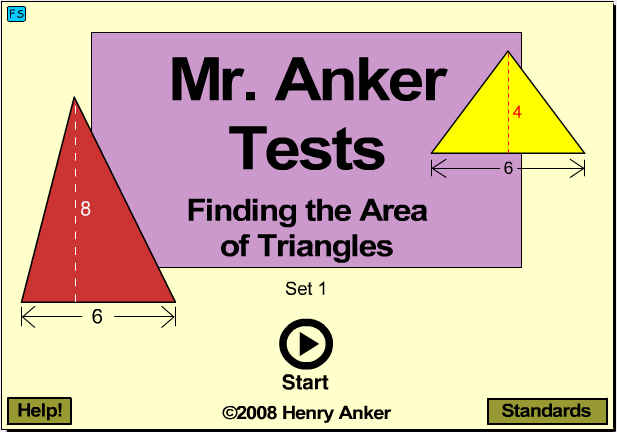 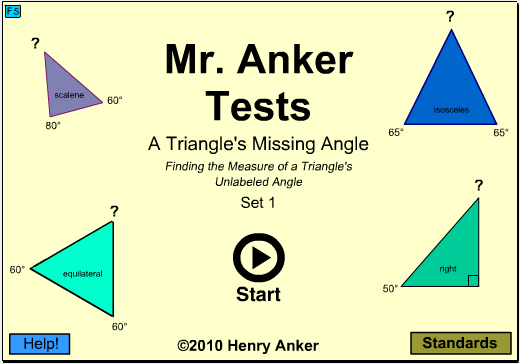 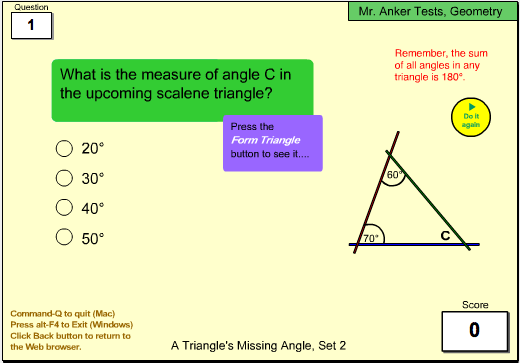 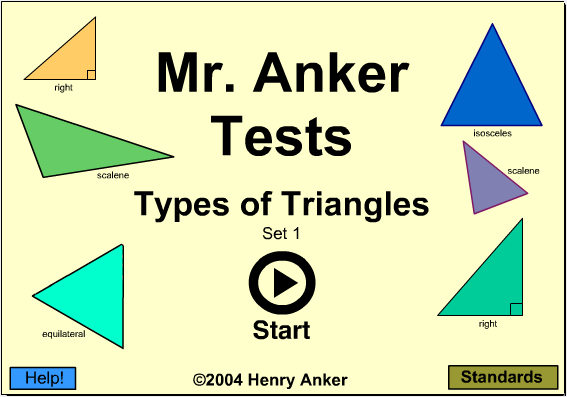 Calculate the measure of a triangle's missing angle based on the number 180. 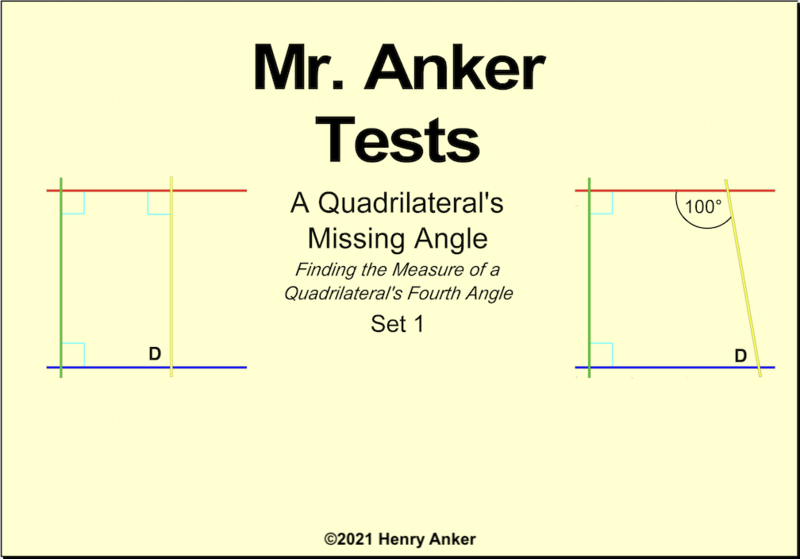 Calculate the measure of a quadrilateral's missing angle based on the number 360. 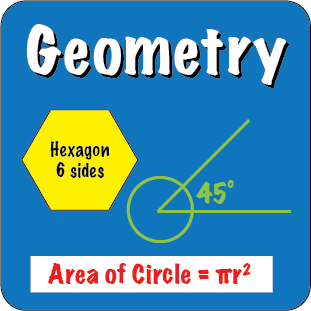 Learn the amazing figures a circle can transform into by folding a circle into them. 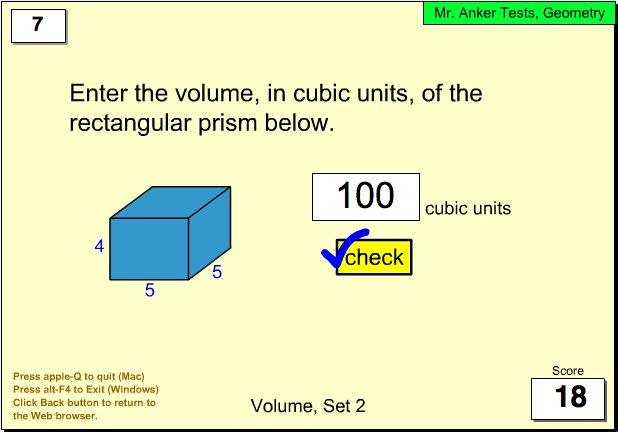 Use the formula L x W x H = V(cubic units). 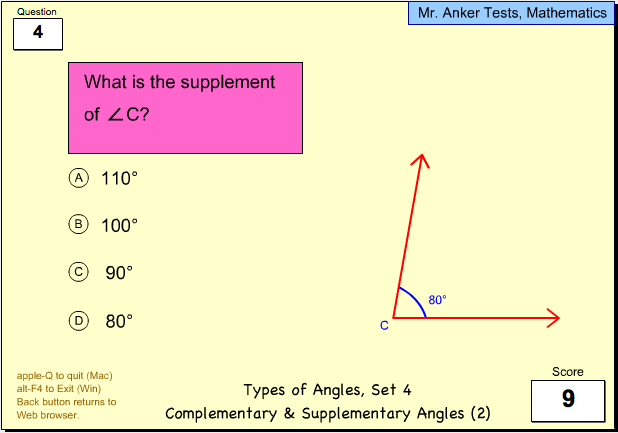 Finding Complements & Supplements to given angles.